The Cherry Hill Fire Department hired seven new firefighters earlier this year. The firefighters graduated from the Cherry Hill Fire Academy on Dec. 2. On Dec. 2, a nearly two-year long hiring process finally came to a close for the Cherry Hill Fire Department. That night, the Cherry Hill Fire Academy held its graduation where seven recruits officially became members of the Cherry Hill Fire Department. The recruits had just completed training and classes in the seven-week long Cherry Hill Fire Academy. In the days following graduation, the township’s newest firefighters began their first days on the job. Their backgrounds are varied, but they have a common mission of serving the residents of Cherry Hill. Most of the new firefighters have family ties to the business. Scott Vrana of Cherry Hill does not. Vrana has been a beach lifeguard the past 12 years at Long Beach Island. When he saw the Cherry Hill Fire Department was hiring, he decided to apply. Sean Carlin of Blackwood had been a volunteer firefighter in his hometown for a number of years, but his most recent full-time profession was as a journalist. It was last year when Carlin decided to apply for a full-time firefighting position in Cherry Hill and get into the profession his father had for many years. Like Carlin, Dominic Jackson also had family ties in firefighting. The family ties to the business run deep; five generations of Jackson’s family have been firefighters. Regardless of background, the seven new firefighters were challenged during the hiring process. The fire department has a long list of qualifications all firefighters must meet. This includes passing a written and physical exam, as well as a graded oral interview. Carlin felt the toughest part of becoming a firefighter was preparing for the many exams while still working his full-time job. “You had to prep for the written test, prep for the physical test, prep for the interview, prep for the background,” Carlin said. Vrana had the added challenge of not being around firefighters previously during his life. “For me, it was all brand new, even down to the littlest things,” Vrana said. The recruits got a boost as they went through the seven-week Cherry Hill Fire Academy. Bonding could be seen between the new firefighters and their colleagues on Dec. 1, when the recruits completed a run back to the fire department’s central command building on Marlkress Road. On the final leg of the run, firefighters who were not on duty at the time joined the new recruits as a show of solidarity. The fire academy graduation ceremony was special for all who were involved. Jackson was given the Dennis Riley Award at graduation. The award is given to a fire academy graduate who most exemplifies the virtues of courage, honor and commitment. Jackson was proud to receive the award and even more proud when his dad pinned his fire badge to his chest. All of the new firefighters now have positions at stations around the township. Vrana is working at Cherry Hill Fire Station №4 on Springdale Road, Carlin works out of Fire Station №2 on Route 70, and Jackson is working out of Fire Station №3 on Marlkress Road. 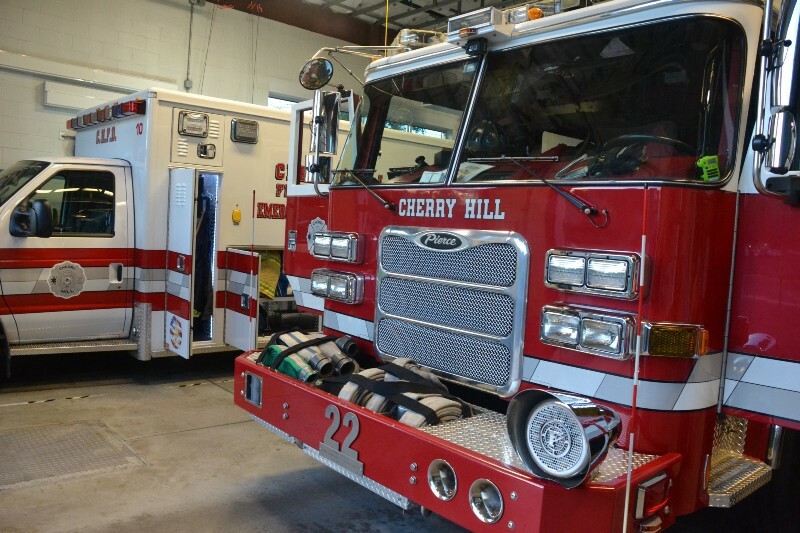 All of the firefighters are excited to keep learning about their new jobs in the coming weeks, but perhaps the most exciting part of the coming weeks is interacting and working alongside others who serve the residents of Cherry Hill. “I’m just looking forward to getting to be a part of the brotherhood,” Vrana said.